8.8oz (250gr) of eight varieties of Specialty Chocolates, each individually wrapped. Select from the Milk Chocolate, Coffee and Cream, Hazelnut-almond, Hazelnut-Cream, Marzipan, Dark Cream, Cream Truffle, and Praline-Cream. The finest ingredients and a selection of delicious chocolates created by master confectioners have made merci Finest Selection a world-wide favorite. Offered here by popular demand. Each box includes a total of 20 sticks of chocolate. You'll find something for every taste. 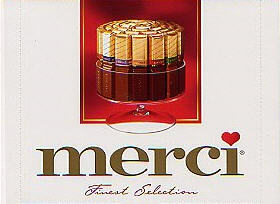 Say thank you with Merci!